The wedding reception is the fun part of your wedding. It's a time of mingling with your guest and a time of rejoicing. All your worries of planning are over, the anxiety over standing in front of everyone for the ceremony is over and all that's left is celebration. Here is where lots of extra money can be spent on little things here and there. Every little thing that you spend money on adds up and it is very, very easy to blow your budget. Keep track of all your wedding reception spending by keeping your receipts and writing down your spending in your planning notebook. 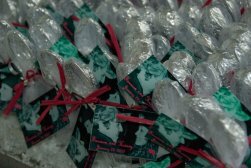 The wedding reception lends itself to several do-it-yourself projects if you have the time. Almost anything you can make yourself can save you money. Many of the favors and decorations can be done yourself and some projects can be found in my projects part of the site. Decorations can be made, you can have friends of the family prepare the food, and the get away car can sometimes be part of a package that comes with the tuxes. 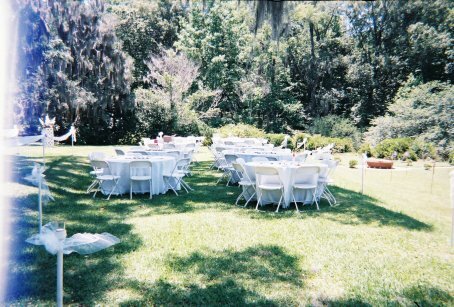 One sure way to save on the wedding reception is to have both the wedding and reception at the same site. 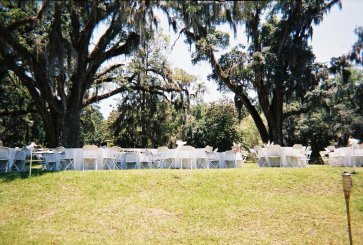 There is a practice called turning a room, which is simply having the site set up for the ceremony and then being reset for the wedding reception. This takes a little more man power, but can be done. 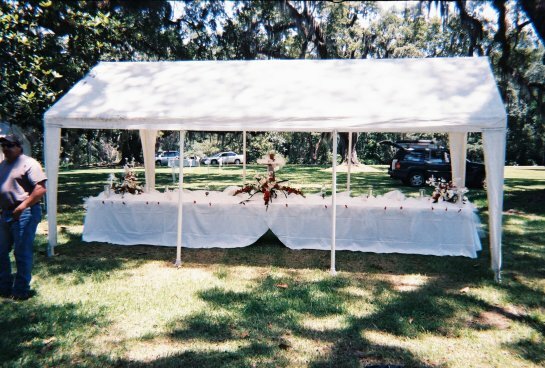 Or consider setting up in a fashion that would both accommodate the wedding ceremony and the wedding reception as shown in the garden wedding photos. Another way is to not have a bar at the wedding. If people want to drink, it can be bring your own. But liquor is a large expense, and it can be eliminated and everyone still be able to celebrate with the bride and groom. 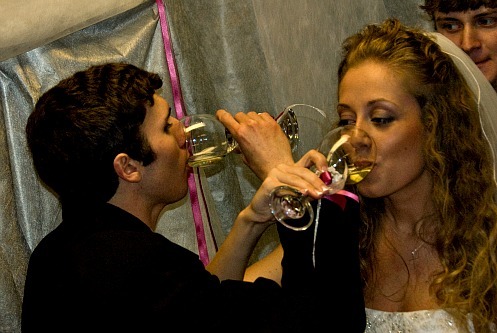 For the toast there can be a wine or champagne bottle for the wedding party or if it is in the budget wine or champagne served at the appropriate time for the toast to the guests. Bar? NO Bar? What?! Well...if you insist. How about a candy bar. (heehee) Depending on the candy you use, this trendy bar can be done by the frugal bride. Pick several candies and put them in pretty or creative little vases, bowls, or other containers. Be sure to have serving spoons and cute little bags, boxes or cups to put all the goodies in. These candy bars are always a big hit. And hey, don't forget the chocolate. Easy Checkout and $9.95 Flat Rate Shipping at ACandyStore - Buy Candy in Bulk, Save Time and Money! Keep decorations simple. There is a wonderful fabric called gossamer that is very sheer and can be used in the place of tulle. 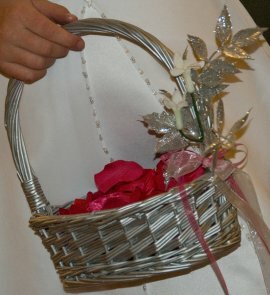 Gossamer is much less expensive and with a little ribbon added can make a very nice presentation. Use plastic goods instead of real china. Tacky you say? Nope! Not any more. Some of the newer stuff on the market will fool you until you touch it, but even then it's sturdy and very acceptable for a buffet, or bar-b-q type service. There are several options that resemble fine dinnerware. The same goes for the wedding parties toasting glasses. Some of the flutes offered in plastic at party shops make a fine substitute for real glasses. Add a little ribbon and perhaps a small flower or charm and you have a nice presentation. Don't worry with personalizing the napkins. You can have the napkins at the cake table personalized, but the rest at the food tables can simply be regular paper dinner napkins. 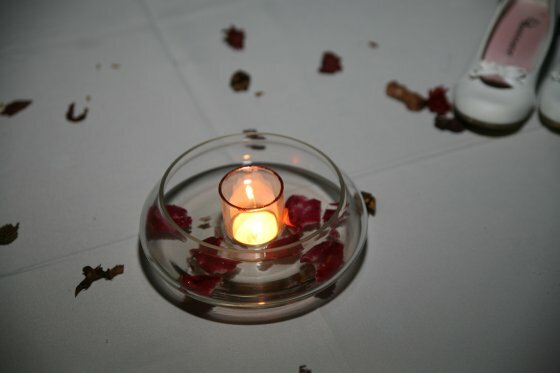 Keep the table centerpieces simple also. 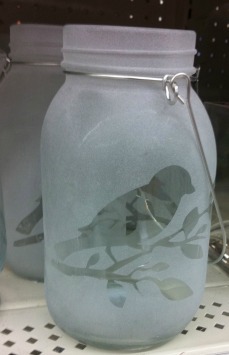 A single flower in a vase or jar; even a mason jar might work for some weddings. 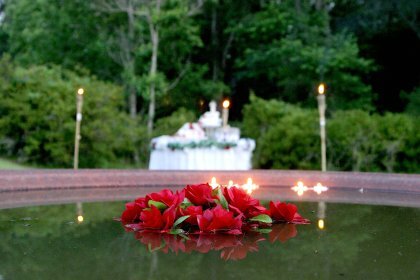 Rose petals and a small votive candle or even a single open rose with the stem cut off placed at the center with a little ribbon or confetti would work. The simpler the better. 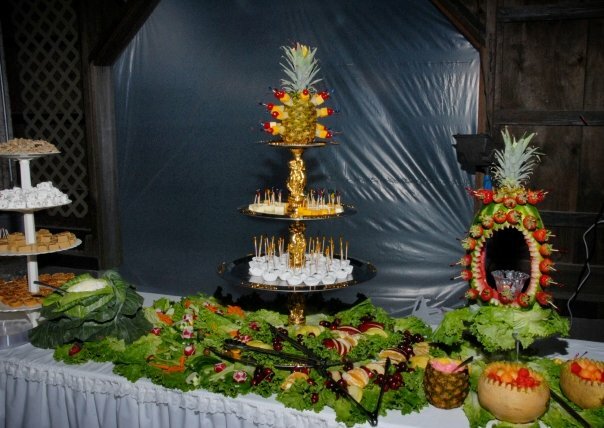 For theme weddings, you can use anything that would carry the theme to the tables. A Cinderella themed wedding could use small toy tiaras, slippers, and coaches. All of which can be purchased very inexpensively at party shops. For the Flintstones, a nice arrangement of pretty rocks. You get the drift. Look in magazines, search the internet and get some ideas of what you might want to use. Narrow it down to your one or at most two best choices. Stay in budget as you choose. Think in terms of what can be made. Very nice fans and sachets can be crafted. Your imagination is your limit here. Have fun, but be frugal and calculate the time it will take to make the projects. Allow yourself plenty of time to finish them before the stress level rises near the wedding day. 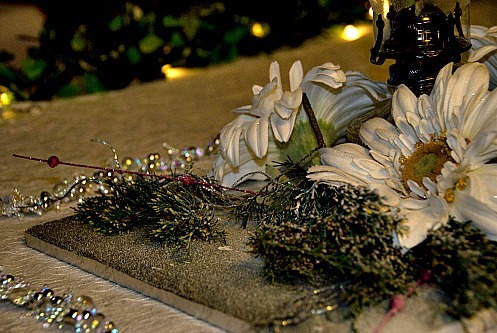 Made with christmas bead garland, silk flowers, Pine branches and spray snow. Hiring the band for the last 2 hours of the reception instead for a full 3 hours, which is the norm, to save some money. A small band may charge less also. Or don't have a band at all. A DJ is much less expensive and no music at all would be the most frugal choice. Play background music on on CD on a sound system. All these options are acceptable and will be dictated by your finances. Stay within your budget! Last but not least, look for ways of adding a little pizzaz to make things look a little more elegant. A little flower tucked here a little silver something or ribbon pinned there. It could make a big difference in going from blaaaa to fab! No matter what the bride and groom choose, the guests are there because they love the couple being married and when all is said and done a few hours will hardly be remembered in time to come. When you've said "I do", then what? You may be able to find supplies for your crafts and decoratings at Shindigz. Try them out!